Last November, Lurlene and I did the SEMA show, and saw this little tart at the Scion stand. At the time, the blogs were abuzz with talk of a Toyota/Subaru joint sports car. This was our clear-as-day sign that the Toyota version was being run through Scion. Seven months and a few cosmetic tweaks later, voila. 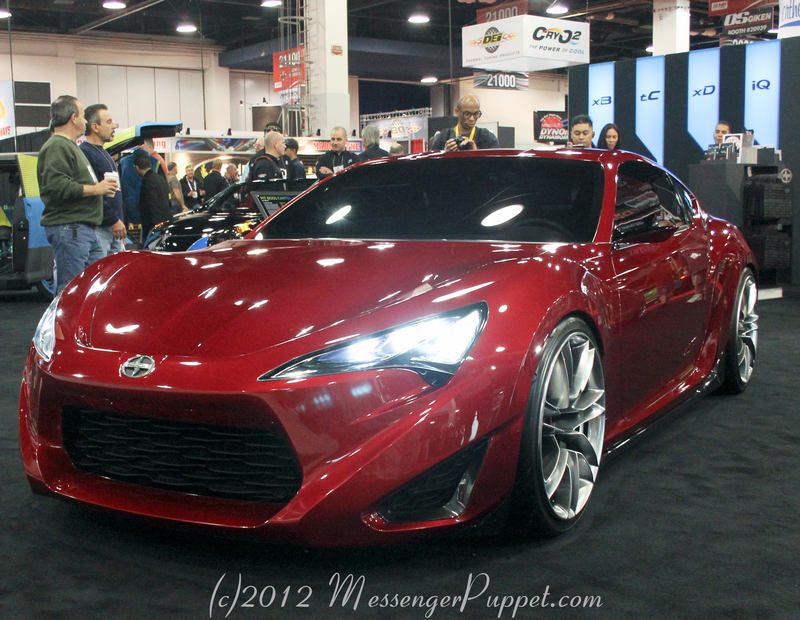 I’m a little bit confused though – Scion is now equivalent to Toyota? (“the Toyota racing vehicle takes the next step”) I thought they were supposed to be like distant relatives. It’s not wrong to invoke the AE86 that everybody and their dog seems to love. Ditto the 2000 GT (Bond-san). I’m just confused by the marketing. Is Scion separate brand or is it not? I understand when AZ can’t figure it out and thinks I drive a “Toyota Scion xB van” – I assumed Toyota would knw what it wants to do. Brought to you by the all new Scion FR-S. I do like the looks and the curves. It’s not weird for weirdness’ sake (apart from the goofy color names). Still, I would just call it “Toyota Celica” and declare victory. Keep the weight down and it’s still no mustang but watch out Hyundai Genesis coupe.